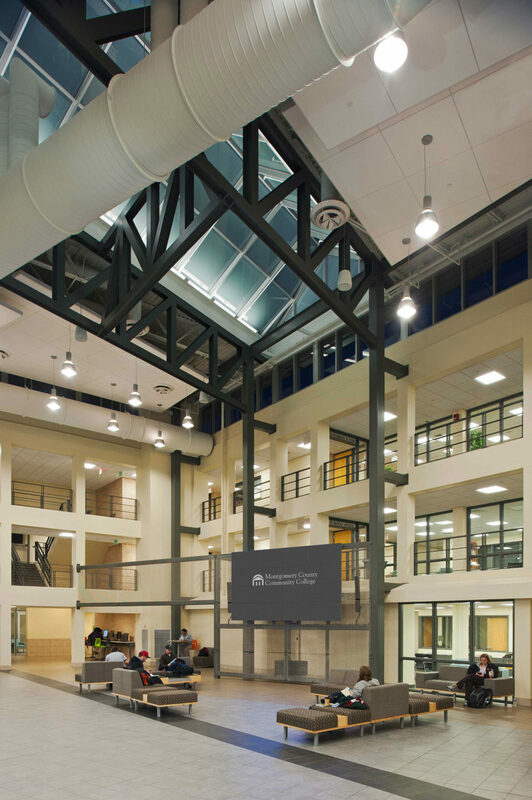 Parkhouse Hall, an existing classroom facility at MCCC suffered from poor circulation, lack of community feel, and outdated and underutilized interior spaces. Spillman Farmer developed a unique phasing plan to keep the building operational while transforming the building from inside out. Parkhouse Hall is the primary classroom building on the Montgomery County Community College campus. At 140,000 SF, Parkhouse includes 64 classrooms and more than 160 offices, conference rooms, and related spaces. It is home to the College’s Social Sciences, Humanities, Business, Computer Technology, Continuing Education, Workforce Development, Entrepreneurial Studies, and Math departments. The building’s original “doughnut” configuration created problems for the its day-to-day operation. The main circulation spaces of the building turned their back on the courtyard and didn’t take advantage of its natural daylighting. Further, the circulation was mismatched, creating a “split-level” effect on its upper floors. With no central gathering space to speak of, the building suffered from a lack of community. SFA developed the insufficient central courtyard into a sky lit interior atrium that acts as the new heart of Parkhouse Hall. This atrium, a meeting place and campus living room, opens to the office suites on all floors. All these interior spaces were upgraded with new finishes and state-of-the-art technology. New stairs remedied the “split level” situation and reorganized the main circulation paths for the building. New HVAC systems and restrooms bring Parkhouse into modern code compliance.